The Environmental Defense Fund likes to lead by example. It’s an environmental organization that works closely with major corporations to find economically viable and environmentally responsible solutions to problems. The expansion project reunited the Envision Design and GHT Ltd. design team responsible for the original project with rand* construction, contractor on the 2001 project. The renovation included a major reconfiguration of 5,376 SF on the 6th floor, and the addition of 6,960 SF on the 7th floor. 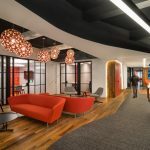 Although achieving LEED certification was a high priority for EDF, the organization did not want the LEED rating system to solely drive its design objectives. After all, it’s an environmental organization that focuses on a broad range of environmental issues. Since the days of the Pilot Program, building codes and environmental regulations have become more stringent. Because the LEED-CI rating system awards points for improvements to the base criteria, the design of a base building — and how it meets the current building codes — has a direct impact on the quantity of LEED- CI credits that can be achieved. If the base building has older, outdated systems it typically makes achieving Platinum certification unfeasible. These existing building constraints made Gold the highest achievable certification level. The 2011 renovation project introduces new wood elements with FSC rift cut oak veneers for new millwork credenzas, wood doors, and paneling. The stair treads are oak, salvaged from old barn beams, and the wood used in the table and banquette in the break room is walnut sourced from urban tress that had blown down in storms. The market for reclaimed lumber alone has dramatically increased within the recent past. The reclaimed solid oak treads are from fourth quarter 18th century German barns in South Central, PA.Ãƒâ€š Each tread is a solid piece of oak milled down from the barn beams that show a varied character of checks, wormholes, grain pattern, and old wood patina. The solid wood elements were sourced within 500 miles and built by Reclamation Lumber from New Haven, CT. They are a company that embodies many aspects of the green movement beyond salvaging wood; their manufacturing plant is on a brownfield in and old trolley garage that had been slated to be demolished. The carpets selected for the new project meet the rigorous requirements of CRI Green Label Plus and are NSF/ ANSI 140 Platinum and Gold certified. The ANSI/NSF 140-2007e Standard evaluates carpets on five key attributes: Public Health and Environment; Energy Efficiency; Bio-based and Recycled Content; Manufacturing; and Reclamation and End of Life Management. Office Carpet Tiles – Lees Modular Carpet Tiles: These contain 35% pre-consumer by total product weight content with Ecoflex backing. The carpet tiles incorporate Duracolor Permanent Stain Resistant Technology, which improves indoor air quality. The tiles and adhesives are CRI Green Label Plus certified. The Lees factory is an ISO 14001 and 9001 certified facility, located in Glasgow VA— 207 miles from the job site. The product is NSF/ANSI 140 Gold certified. Corridor and Conference Room Carpet – Shaw Modular Merge Carpet Tiles and Shaw Modular Plank Carpet Tiles: These contain between 28% – 31% pre-consumer and 12% post-consumer by total product weight content.The EcoWorx backing contains 40% recycled content, is PVC free, and is Cradle to Cradle certified. The tiles weigh 40% less than traditional carpet tile backing for easier installation and more efficient shipping. The carpet nylon is Eco Solution Q which contains 45% recycled content. The process used for the Eco Solution requires 18% less energy to make than nylon 6,6, a conventional nylon fiber. The tiles and adhesives are CRI Green Label Plus certified. The Shaw factory is an ISO 14001 certified facility. The product is NSF/ANSI 140 Platinum certified and Cradle-to-Cradle Silver certified. Break Room – Resilient Flooring: Forbo Marmoleum Striato flooring is linoleum, a rapidly renewable resource. It is specified in a light color for high reflectance value. Copy Room – Resilient Flooring – Expanko Rubber flooring at the copy rooms has 35% recycled content. Expanko is manufactured in Parkesburg, Pennsylvania, about 100 miles away from EDF offices. Now that more GREENGUARD certified furniture is available with FSC wood content, EDF opted to furnish the 7th floor offices with desks and overheads with Gunlocke case goods in lieu of having them custom fabricated as was necessary in 2001. The manufacturer, Gunlocke, was selected for their commitment to sustainable stewardship, green business practices, and for their regional manufacturing location in Wayland, New York, about 320 miles from the EDF offices. Gunlocke furniture was specified predominantly for the new furniture which includes guest chairs, conference tables, dining tables, and lounge chairs.Ãƒâ€š The furniture is made from FSC substrates, solid wood or veneers, has high recycled content, and is either Level 1 or Level 2 certified.Ãƒâ€š All textiles selected are eco-friendly, with rapidly renewable content, high post-consumer recycled content, or 100% recycled content. Textiles were 100% recycled content, high recycled post-consumer content, or Cradle to Cradle certified textiles were specified in both the original and renovation projects.Ãƒâ€š 10 years ago the selection was rather limited. Fabric panel core material is made from 40% post-consumer recycled content and is GREENGUARD IAQ certified. GREENGUARD certification is a third party certification that certifies products and materials for low chemical emissions promoting healthier products and materials for indoor environments. Workstation Tack boards of Forbo Bulletin Board is made from 87% rapidly renewable materials, a combination of oxidized linseed oil, rosin, and cork, and is comprised of 41.5% pre-consumer recycled content. Pantry countertops are IceStone counters are manufactured in Brooklyn, New York, about 230 miles from the EDF offices. The product is manufactured from a mix of 100% recycled glass and concrete and contains no materials with volatile organic compounds (VOCs).Ãƒâ€š IceStone has received Cradle to Cradle Gold level certification and is 100% recyclable. Zero-VOC paint was specified. Light colors were selected with high LRV to reflect light. Gypsum board specified is flue gas desulfurization type synthetic gypsum board fabricated with 100% post-consumer recycled face paper. Ceiling tiles — Armstrong Soundscape Shapes — at the break room contain 82% recycled content and Armstrong Ultima tiles at the conference rooms and interior offices contain 65% pre-consumer recycled content and 15% post-consumer content from recycled ceilings.Ãƒâ€š The tiles are regionally manufactured in Marieta, PA, 104 miles from the project site. Both ceiling tiles were selected for their sound absorptive and high reflectance values. Presently, EDF is seeking Gold-level certification for the renovation and expansion of its office space under the LEED-CI 2009 3.0 rating system. Previous articleDo We Really Need Business Cases for Healthy Indoor Environments? Thanks so much for your great effort in writing this informative post.